This report reveals how top providers and payers are finding new and better ways to align incentives and share risk. Early efforts at delivering value-based care have benefited patients and payers more than the providers who do the work. 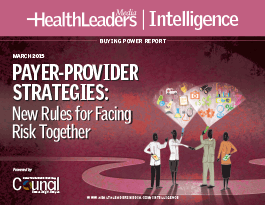 This report, Payer-Provider Strategies: New Rules for Facing Risk Together reveals how providers are finding new ways of caring for both patients and populations based on a better understanding of risk. Find out how UPMC Health Plan has saved nearly $15 million in medical costs since converting its primary care practices to its patient-centered medical home model. Uncover the key discipline that payers have mastered and that providers must learn, or at least better understand. Get examples of how North Shore-LIJ Health System and its CareConnect health plan subsidiary use shared data and shared clinical practice guidelines to align incentives. Discover how best to demonstrate organizational strength during negotiations with commercial payers. See how Crystal Run Healthcare’s care standards for diabetes patients helped to reduce office-related charges by about 9 percent and hospital admissions by about 14 percent. Find out how primary care physicians, specialists, and staff at Crystal Run Healthcare collaborated to implement effective care standards based on best practices.